A confined animal feeding operation. "Unnecessary or incorrect antibiotic use in...agricultural production has worsened the problem." USGS photo. Several times a week Brad Spellberg struggles with a difficult decision. A patient stumbles into his emergency room in southern California suffering from familiar symptoms: pressure when she urinates, pain in her side, fever and nausea. Based on these clues Spellberg can quickly diagnose the problem as a kidney infection, but the trouble lies in deciding what he should do next. He knows the patient is hurting and of course he wants to help, but more than his patient’s health hangs in the balance. Story here. and benefits " to Manitobans. And he was right! water sources and Lake Winnipeg as the end designation. dangerous superbugs that current antibiotics are powerless against. finding Colistin-resistant E.coli in a pig intestinal sample. that much closer to what has been referred to as a post-antibiotic era, where people will die from once-treatable infections. 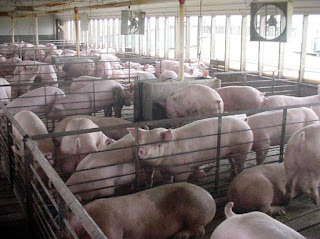 hogs in a fashion that endangers the very lives and well being of people"? the seriousness of the situation and has become involved. "UN meeting tackles the 'fundamental threat' of antibiotic resistant superbugs". high level meeting for a health issue. The dangers are real, and must not be ignored. Governments must re-act accordingly to direct the hog industry. This is not a time for complacency.